Vermont holds a special place in my heart. 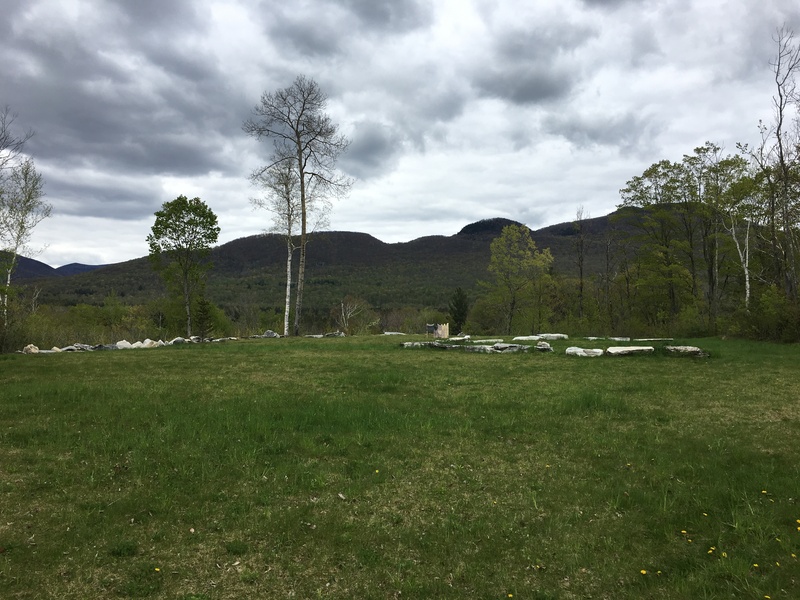 And returning there for the residency at Marble House Project, now in its fourth year, I was struck by the green, the lush rolling hills, the tall wild grasses and the green tint of long unused marble quarries. The residency is housed on a defunct marble quarry in a large house clad in white Danby Marble, with formal spring-fed gardens based on those originally built during the Renaissance, and amongst many outbuildings. 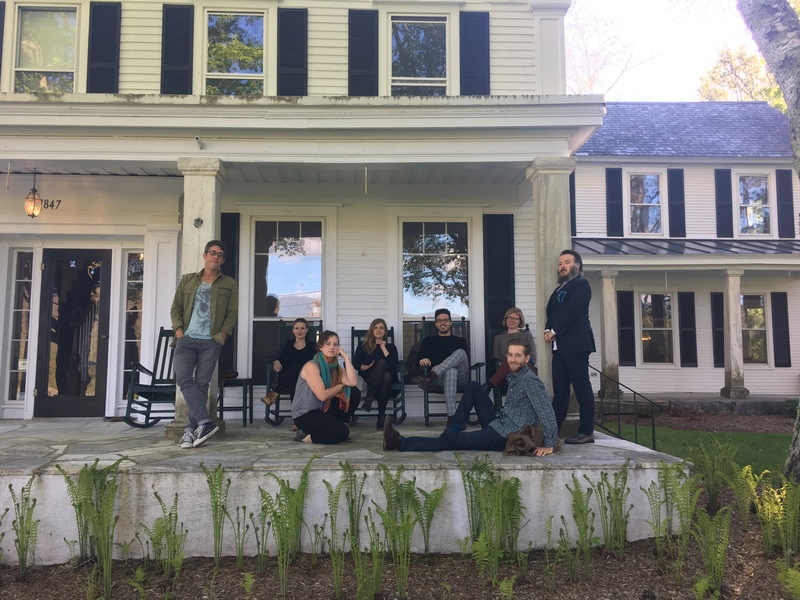 The Marble House Project hosts up to 9 residents at a time – some visual and performing artists, as well as writers, musicians, curators, and a newly instated Chef residency – in several sessions per summer. Residents live and work on the “campus” with small private studios, have focused time for their art along with working in the gardens, weekly events open to the public, and cooking and eating with the other session residents. I tend towards making swift work, with long periods of quiet, and then long periods of preparation, with a burst of energy in the studio. A three-week residency, though it seems relatively short, should be plenty of time for me to create a body of work. But despite what I believed to be ample time, in a region in which I am somewhat familiar, I had quite a struggle finding a rhythm. There seemed too much to be distracted by, and so much to look at and wonder about. 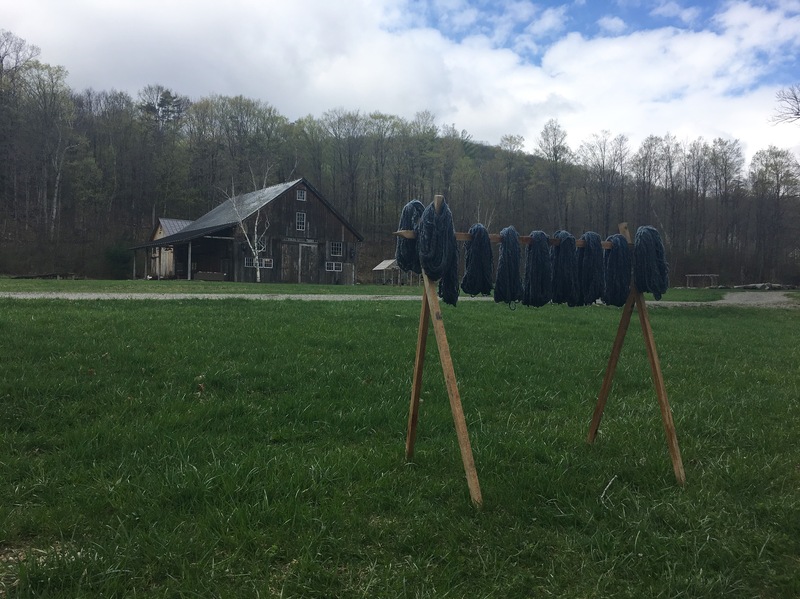 As I labored through different dying processes, finding as much time as I could between rain clouds to dry the yarn, I made myself slow down and think about process. I thought about endings and beginnings and how sometimes we don’t have the answers and we can’t find the correct paths, and I hoped that was ok. I hoped that getting away from my studio to restart and refresh was allowed to feel like this. That it was acceptable to struggle. As I began to move through the work, I utilized any sunny days to work outside. It was important to me to feel a part of the landscape, even if the work I made would ultimately be inside, and removed from this location. 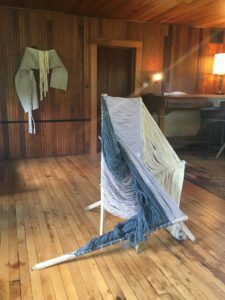 In this way, the act of making the work, made it indelibly part of the experience of place. 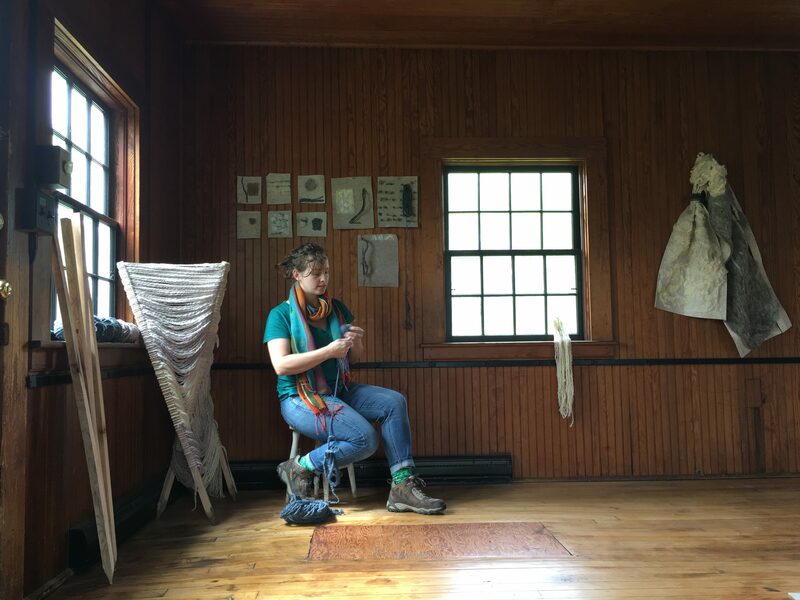 Moving back and forth between my studio and the greater campus of Marble House, I experienced the solitary moments, the still moments, the moments of closing inward. Outside, the space was vast, though I was still generally alone, the space was open and full. This expansion and contraction is strongly associated with my work and process. The building of large open forms, with the eventual breaking down of shape and line. Bringing the works inside, also brought the memory of the outside, in. It gave the works the markings of dirt and grass. The completion of the work involved a literal balancing act. 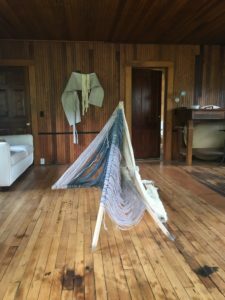 Each day for three days, I set up the work, went to sleep for the night, and returned to find the piece in a jumble on the ground. This process of repetition, of creating something new from the same bones, helped me to see the work in a new way. The process, though similar to what I’ve done in the past, had a real direct relationship to the struggle to make work that I was feeling everyday. 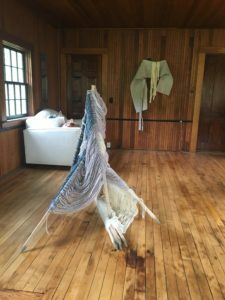 I’ve been back in my home studio for about a week now, unpacking the work shipped from Vermont, and again beginning the process of making new form from existing lines. I feel energized and excited after the somewhat stressful three-weeks away. But certainly, there is so much generated in that struggle to find shape. Ariel Herwitz (b.1983 Atlanta, GA.) lives and works in Los Angeles, CA. She earned a B.A. 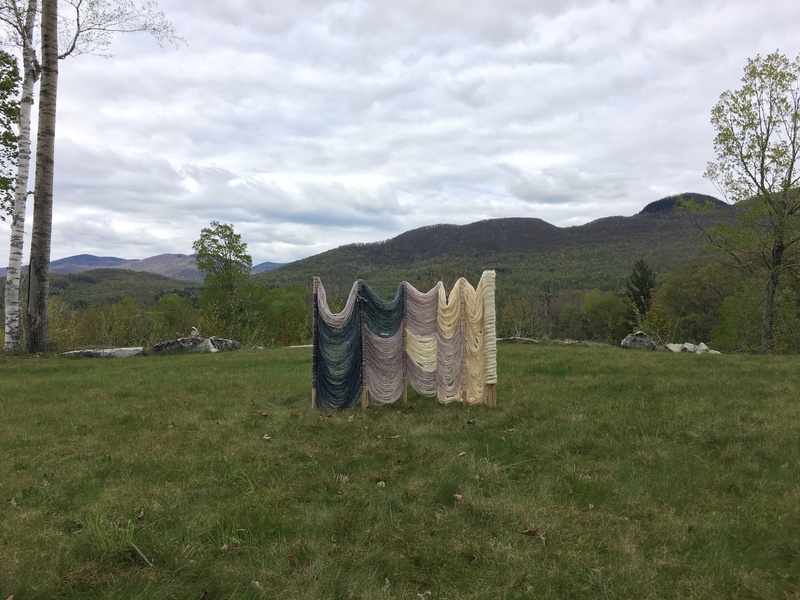 in Visual Art from Bennington College in 2006, and an M.F.A. from Cranbrook Academy of Art in 2011. Her work has been exhibited throughout Los Angeles at Marine Projects, Loudhailer Gallery, Greene Exhibitions, and Ambach and Rice. She completed her first solo exhibition last fall at Ochi Projects. 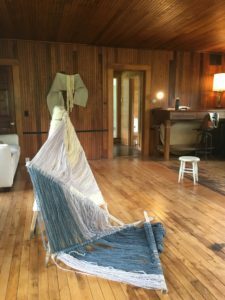 Her works explore through form, composition, color and texture, ideas of interpretation, understanding, and the subjectivity of the view or gaze.